The original tale of Tarzan was created by American writer Edgar Rice Burroughs, who is famous for having mastered the classic “jungle” movie which represented African culture through Hollywood during the beginning of 20th century. The original story depicts a European family of high title on vacation in the “heart of Africa,” when the parents are eaten by a cheetah and the baby boy is saved by a family of apes who name him Tarzan and raise him as their own. The boy grows up embodying apelike and savage features, being completely dehumanized as a character, until a group of European researchers arrive in the jungle. Among them is artist Jane Porter, who was written to be intelligent, civilized, and feminine, all things Tarzan is not. As the plot progresses their cultures combine, as Jane civilizes Tarzan and he teaches her how to overcome the dangers that Africa presents. The original Tarzan movie “Tarzan the Ape Man” (1932) was strongly representative of this original story, which created a culturally inaccurate film that degraded African people and provided the Europeans with the majority of the power. By watching the film, you essentially witness a visual representation of colonialism. The dichotomy between civilized and savage, which is to say, white and black, is represented in the character’s actions, costumes, and dialogue. White characters carry on in the jungle as if they own the place, while black characters are merely the background dwellers. In fact, audiences are invited to relate more closely to the animals than the black humans. Black representations in these films could hardly qualify as human. They are portrayed as lazy natives, savages, and pygmies. Disney seemed to minimize many of the cultural inaccuracies that the original film possessed, but still produced a film that misrepresented Africa and chose to depict it as lesser in comparison to European nations. The first change they made was completely cutting out all black people from the story, which although it reduced racism by avoiding the misrepresentation of Africans, created a new problem by inviting the audience to associate the apes in the story with African people. The apes and other animals are the closest thing to native Africans on screen, and the ways that Tarzan attempts to conform to these creatures hints at the ways that Hollywood is portraying African culture. Tarzan develops animalistic abilities by living in the jungle, such as good hearing, keen scent, and an impressive physical build. He begins the movie as an outsider, and attempts to fit with the apes by copying their primitive behaviors, like eating bugs, walking on his knuckles, and wearing nothing but a loincloth. Tarzan is originally a European, but changes his behavior to fit into the African jungle by becoming more savage, an underlying but powerful idea that sets the tone for the rest of the movie. When Jane and the other Europeans are introduced, they spend less time trying to “civilize” Tarzan, an improvement from the original film. That being said, they still see Tarzan as untame, proven even in the trailer when Jane is quoted saying “I was saved by a flying wildman in a loincloth.” In the end of the movie, Jane and her father decide to leave Europe and live out the rest of their days in the jungle with Tarzan. Although this could be seen as a positive representation of Africa, as these characters essentially decided they would rather live there than back home in Europe, the underlying motives for this decision come from the idea that Africa is filled with adventure, one of the most prevalent African stereotypes that Hollywood is responsible for producing. 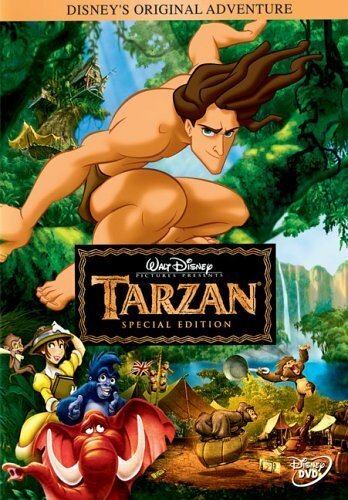 The dangers of this film derive mostly from the actions of the main character, Tarzan, in relation to African culture. As he, and the pack of apes he is a part of, are the closest thing to “Africans” on screen, viewers are put at risk of associating their behavior with African culture. This behavior is primarily savage and animalistic, which although this is a children’s movie primarily about animals, still leaves lasting images of Africans being “savage” in the minds of children, who tend to take concepts much more literally than adults do. This is, of course, far from reality. On the positive side, this movie does not perpetuate the idea that Africans are especially violent, another common stereotype that Hollywood has been known for promoting. Tarzan, the main representation of African culture, is written to be caring, intelligent, kind and brave. The apes are equally compassionate, only using violence when necessary, and defending themselves from the threats the antagonists produce. The truth is, Tarzan is a family friendly movie with a primarily positive message, and there really is no reason not to allow your children to watch it. That being said, it is important to realize the misconceptions that the movie presents and find ways of countering these biases with accurate representations of African culture, insuring that that children don’t walk away with a negatively impacted viewpoint.